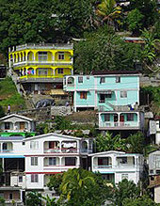 How high are realtors´ and lawyers´ fees in Dominica? What about other property purchase costs? How difficult is the property purchase process in Dominica? For foreigners, the Alien Land Holding License Regulation Act, No. 17 of 1995 of the Laws of the Commonwealth of Dominica, provides for the issuance of Alien Land Holding License. An alien may hold less than one (1) acre of land for residential purposes or less than three (3) acres of land for commercial purposes without obtaining an alien land holding license. However, the alien land holding license fee of 10% of the value of the land is still payable. Citizens of the Organisation of East Caribbean States (OECS) do not need to acquire an alien land holding license. OECS-member states are Antigua and Barbuda, Dominica, Grenada, Montserrat, St. Kitts & Nevis, St. Lucia, and St. Vincent & the Grenadines. Foreigners may also be asked to present other information and documents for transparency as a precaution against money laundering. It takes around 19 to 65 days to complete the five procedures needed to register a property in Dominica. Dominica uses the East Caribbean Dollar (XCD) which is pegged to the US Dollar (USD) at USD1 = XCD2.70. Under the Aliens (Landholding Regulation) Act, No. 17 of 1995, all non-citizens of Dominica are required to obtain an Alien Landholding License to own more than one acre of residential land or three acres of commercial land. The license fee is 10% of the market value of the land. Aliens may own less than an acre of residential land or three acres of commercial land without a license but they still have to pay the 10% license fee. The use of lawyers for property sale and purchase is mandatory. Legal fees are regulated and set at 3% of property value plus 15% Value Added Tax (VAT). Judicial fee is around 2.5% of property value and it is paid to the Accountant General´s Office by the buyer. Assurance Fund fee (1% of property value) for the Memorandum of Transfer is paid to the Accountant General´s Office by the buyer. Stamp duty on conveyance of real property is 6.5% of property value: 4% is paid by the buyer and 2.5% is paid by the seller. Real estate agent´s fee is typically 5% of purchase price. How landlord-friendly is the law in Dominica?